in those walls? Over the bedroom...? In the picture to the right, one can easily see where the heat (brighter yellows) is more pronounced. To a trained technician, this image gives even more information on how to approach resolving concerns in the home. This inspection camera together with the knowledge that a BPI Analyst (energy efficiency expert for existing homes) can give you confidence that you are addressing the core contributors to your home's energy loss. 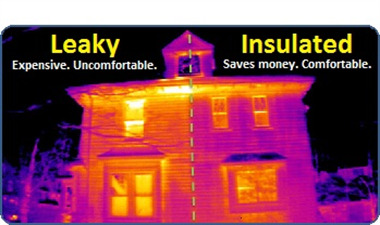 Infrared cameras are used on the inside and outside of the home. 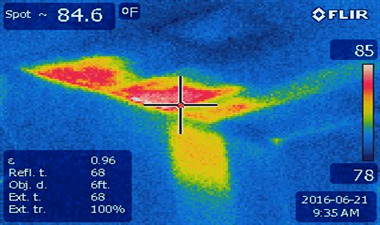 With these diagnostic tools, we can frequently see air infiltration issues, insulation issues, or determine that all is well. While we look at the home from a scientific perspective, this tool provides an added level of diagnostics.